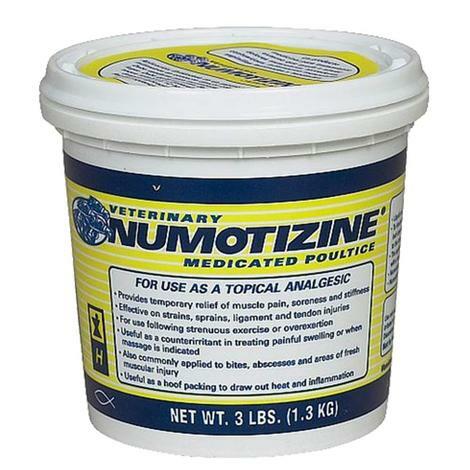 This is the 3 pound sized of Numotizine poultice. This is useful as a hoof pack for drawing out heat and inflimation. This poltice is used to treat bites, abscesses, areas of fresh muscular injury, sprains, strains, ligament injuries, tendon injuries, and bruising. This counterirritant is useful for treating swelling and the pain associated with swelling. Contains guaiacol, methyl guaiacol, powdered clay, fragrance of beechwood creosote, and oil of wintergreen.